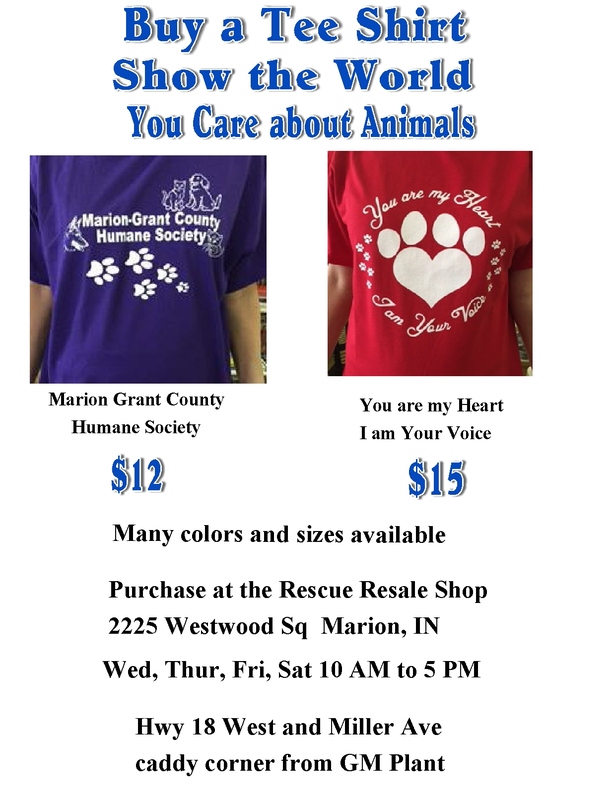 The Marion-Grant County Humane Society is a nonprofit organization on a mission to save more lives. We are always searching for new ways to do fundraisers and to get more of our "kids" to safe and loving homes or rescue groups. We need your help in controlling the pet overpopulation, in turn our overcrowding issue, and can only be done with responsible pet ownership. This entails keeping your animals at your home and getting them spayed or neutered. It seems like the struggles of the Humane Society will never end and we know there are a lot of friends out there that promises when they win the lottery they will take care of all the animals but until then we have to once again ask for help on a smaller scale. The Humane Society’s operating cost is over $9,000 each month with mortgage, utilities, payroll, veterinarian care ($4,000 owed) and insurance. The Society holds fundraisers, has opened the Rescue Resale Shop at 2225 Westwood Sq. In Marion, collect Pennies for Puppies and other collection sources and will try other resourceful ideas to generate the operating money. The Marion Grant County Humane Society is guided by an all-volunteer Board of Directors, with eight full or part time employees and a small group of foster care homes. The shelter’s operating revenue and provisions derives from contributions from kind individuals, fundraising events and the Rescue Resale Shop which is a thrift store where donated items are resold. The Humane Society is over capacity, underfunded and has much determination to make a difference in the lives of the displaced, abandoned, injured and sick animals. Our goal is not only to rescue those in need but to educate people on the importance of spaying and neutering and proper care. Our biggest challenge has been to change a person’s fundamental attitude that animals are of value and are deserving of a humane existences. Marion-Grant County Humane Society now has an Amazon Smile account. You can help support the Humane Society by purchasing things you use every day from one of the Internet's top resellers. About AmazonSmile. AmazonSmile is a website operated by Amazon with the same products, prices, and shopping features as Amazon.com. The difference is that when you shop on AmazonSmile, the AmazonSmile Foundation will donate 0.5% of the purchase price of eligible products to the charitable organization of your choice. Get started using Amazon Smile today by going to http://smile.amazon.com. 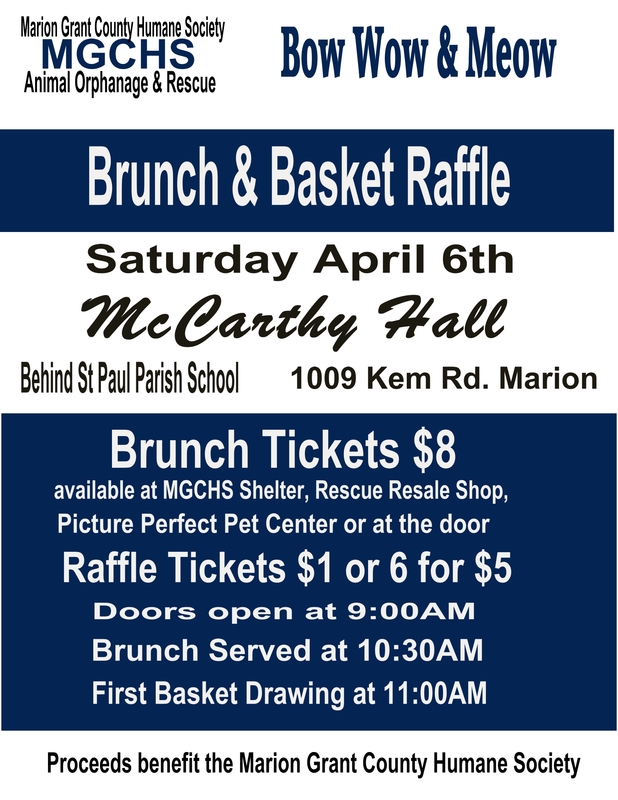 Enter Marion-Grant CO Humane Society Inc in the Search box and select the Marion-Grant CO Humane Society Inc from the options. 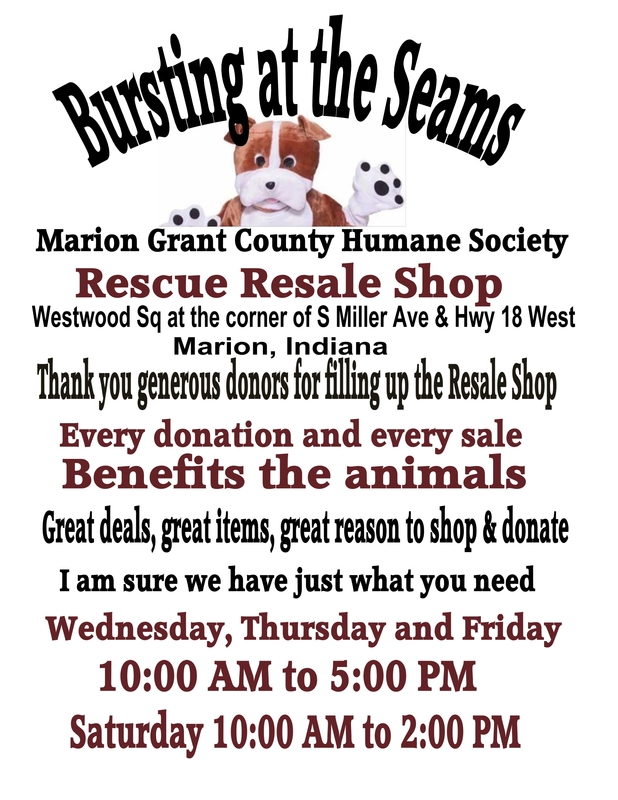 There is something new and exciting happening and it is the Marion Grant County Humane Society Pet & Adoption Center which is an extension of the Humane Society Shelter. The Pet & Adoption Center will be a special place for small and medium size dogs, kittens and cats, seniors, special needs, puppies and those that do not adapt well at the main facility. The Pet & Adoption Center will be an opportunity to promote spaying and neutering, offer educational material, display photos and descriptions of all the animals at the shelter, assist with the adoption process, welcome friends to interact and socialize with the animals. The Pet & Adoption Center is located at 1374 N Baldwin Marion, IN behind Picture Perfect Pet Center with open hours 10 AM to 6 PM. We are in the process of positioning the pens and constructing the cat and kitten areas so please watch for the Grand Opening! We believe the Pet & Adoption Center is a crucial undertaking in spite of an already tight operating budget because if one life can be saved and people can be educated on the importance of spaying and neutering and Grant County becomes a “No Kill Community” our mission is accomplished.